"CHECK in at Social media: 2015 LOY KRATHONG"
"Loy Krathong Festival" November 24, 25 and 26, 2015. Activities: Each year the Loi Krathong festival features activities at various venues throughout the city such boat races, lantern procession and contest, Beauty contest, and Krathong parades and contests. make your Loy krathong and "get on board"
The Thai-Australian Association of Western Australia Inc was established in 1980 to foster cultural understanding between Thai and Australian people. 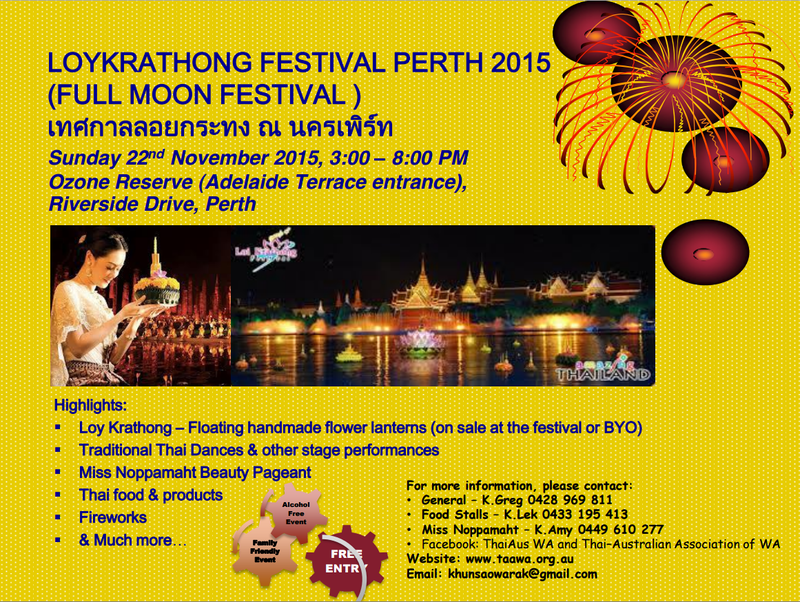 Loy Krathong is an annual Thai Festival event displaying beauty and charm for the whole family to enjoy. Thai Dances, Beauty Pageant, Thai Food, Fireworks and more. TAAWA hosting this event at Ozone Reserve Perth WA.